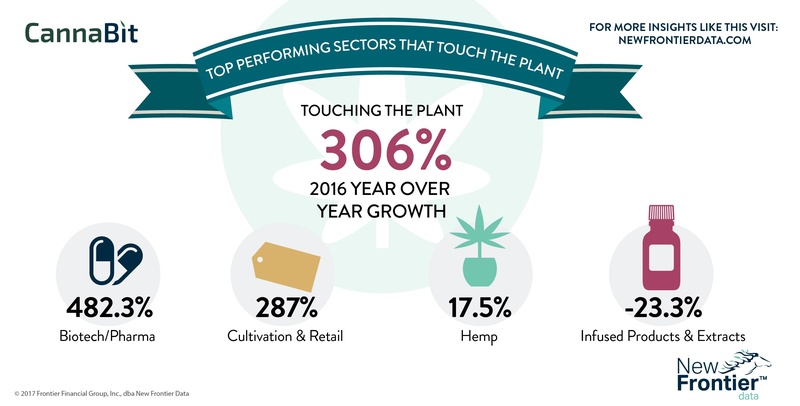 In 2016, investment in cannabis businesses that touched the plant grew 306% year over year. That compares to the 161% growth seen in the ancillary market (i.e. businesses that do not touch the plant). Investment in cannabis biotech and pharma companies led the way, growing 482% reflecting the growth in therapeutic applications for cannabis and the long-term value of cannabis-derived intellectual property. Cultivation and retail company investments saw the second-highest growth, increasing 287% as investors saw opportunity in market growth with 10 states approving medical or adult use legalization in 2016 and by continued consumer demand in cannabis legal markets. The U.S. is the world’s largest consumer of hemp products, but most of the hemp sold in the U.S. is imported from other countries. Because of this, investment in hemp businesses grew a comparatively modest 18% year over year. The only sector in which public investing fell between 2015 and 2016 was infused and extracted cannabis products, which fell 23% from 2015. This decline follows two years of strong growth in this sector. New Frontier Data, in collaboration with Viridian Capital Advisers, has released Investing in the Cannabis Industry, a landmark new report on capital flow and investment in the cannabis industry.